A typical mold or EDM process involves several machining technologies, primarily milling grinding and polishing. WireEDM is a popular and widely used technology that is quickly becoming an important tool in today's competitive market. WireEDM is also used for cutting mold components made from hardened steel, where parts are particularly difficult to mill. Similarly, when a job requires fairly small radii, or when the cutting depth of a part or an electrode is too difficult to machine using a milling tool, As wire is not affected by constant wear, as are traditional milling tools, wire results are always exact, no matter what complexity of the job. Fikus WireEDM application offers a flexible and functional solution for today's toolmaker, and it not dependent on the age or type of wire EDM machine in use. Fikus WireEDM is specifically designed to produce 2- to 4-axis toolpaths easily and quickly, using a range of innovative tools. The product is a Windows 32-bit native application, with dynamic OpenGl rendered graphics, and user interface with clear and concise icons and toolboxes, making the learning process easy. The major machine manufacturers (AGIE, CHARMILLES, SODICK, ONA, MITSUBISHI, FANUC...) are implemented with optimized technological tables. 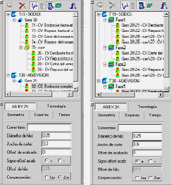 The Fikus WirePath (WP) Manager allows for easy creation of wire procedures. This procedure is a combination of geometric and technological data presented in a logical tree, easy to create and edit at any stage in the process. The set of procedures may be saved as a template and applied to other geometries at a later stage. Using this feature, a machining process may be saved and reused. Manipulation of geometries and procedures in the WP Manager (i.e., create, edit, move, copy or delete) are possible using standard Windows features - copy, cut, paste, drag and drop. Using the "Sort by phases", Fikus WireEDM groups the procedures into types, and performs all rough operations (of all geometries) first, then continues with skimming or scraping the remaining cut operations. Here the user can perform all the roughing procedures (i.e. cut until scrap remaining stage). This can be done at night, for example, and complemented the following morning, by the scrap or performing skim passes. . Using "Sort by geometry" Fikus groups the procedures according to geometry, performing all operations on a given geometry prior to continuing the process. "Sort by geometry" and "Sort by phases" may be selected at any time. Fikus WireEDM solution provides comprenhensive cutting options for 2- axis parts with multiple contours and draft angles. In 4-axis, Fikus WireEDM enables powerful construction of the UV contour using an advanced construction tool a 4-axis synchronization of the two contours, XY and UV. The No-Core-Cut option allows for an unattended roughing operation, with the option of using a predrill. Stop points and technology points are then placed graphically and interactively on the screen. During the creation of the part , the user can visualize it as a solid rendered object and dynamically pan, zoom or rotate it using the OpenGL standard graphics operations. Changes made (height, draft angle, or synchronizing the contours), are automatically shown on the screen. View manipulation can be performed during toolpath simulation. Fikus is an application that provides a solution for programming wire EDM machines, which assist the user in producing complex toolpaths quickly and efficiently. Customized tables for each machine and IMS post-processors, help to obtain accurate G-codes and allow the user to work in a familiar environment. . Fikus automatically detects core, cavity, parting lines and parting surfaces, enabling the user to clearly view each part. The user can select roughing or skimming passes, while the application sets the required parameters and automatically creates the appropiate toolpaths. Multi- contour selection is enable " by window " and the application detects islands and closed and open contours.